One morning, twenty years ago, I woke up to find myself a Deutschmark millionaire. The editors at Michel had completely re-written the catalogue pages for Armenia. They had taken the 1978 book by Zakiyan and Saltikov and given their own listing a new and excellent structure, only unsatisfactory at the end where they ran out of space and compressed the listing of the 1923 overprints on the Yerevan pictorial set. In addition, they had re-priced everything, for the most part intelligently - after all, Michel is a catalogue in a quite different league to Scott or Yvert where you don't expect any knowledge of the subject to be on display. But they had made one big mistake. 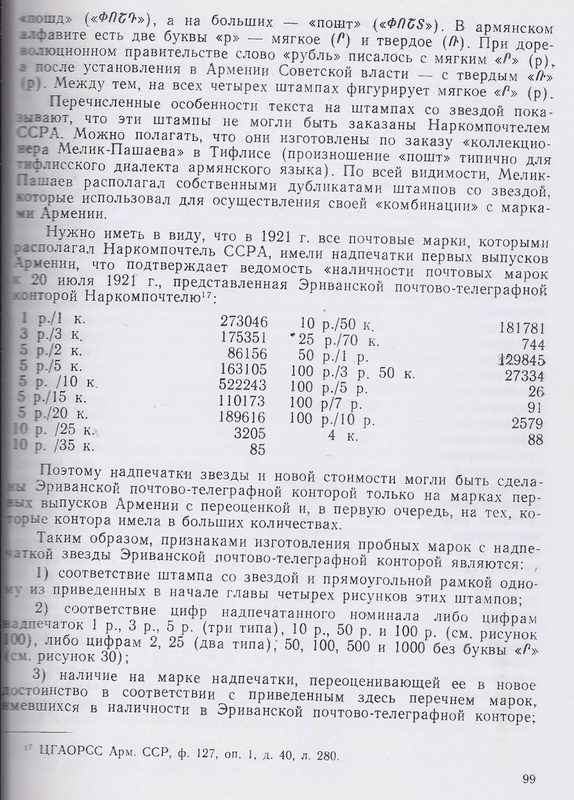 Zakiyan and Saltikov published (page 99 of their book) a Yerevan document prepared by the new Bolshevik administration in 1921, listing quantities of Dashnak stamps remaining in the post office - some numbers very large, some very small. The Bolsheviks located over half a million copies of the 5 rouble on 10 kopeck but - apparently - only 85 copies of the 10 rouble on 35 kopeck. But Michel thought this was a list of numbers issued, not numbers remaining. Big mistake. 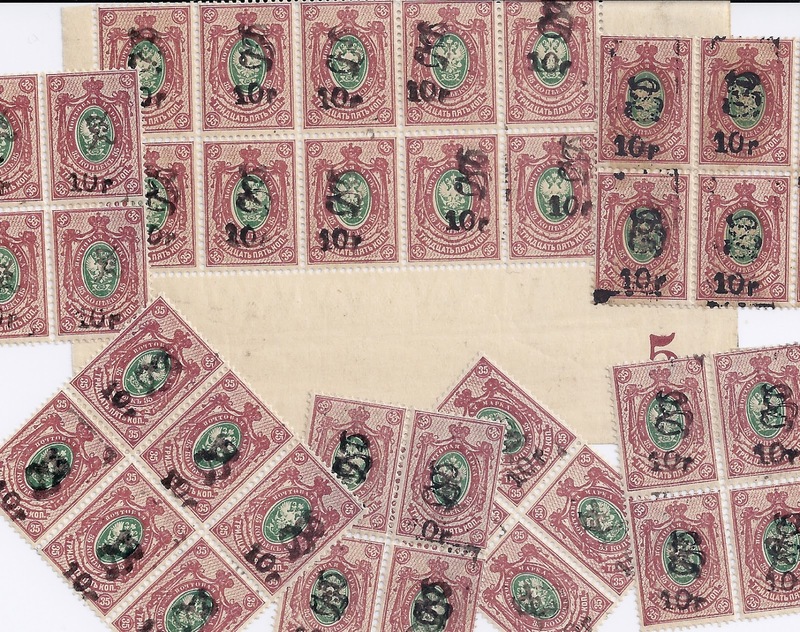 As a result some common stamps, notably the 10 rouble on 35 kopeck surcharge, appeared with fantastic never-before-seen valuations: 1500 DM and even more (3500 DM) when the 10r was applied over an existing framed or unframed Z. In this way I became a Deutschmark millionaire. I had hundreds of these stamps then and I still have dozens (see the selection above). Twenty years on, sellers regularly fall into the trap Michel has created and offer these common stamps as rarities - look at ebay or delcampe or Philasearch and you are almost certain to find one. In reality, the 10 rouble on 35 kopeck perforated should probably retail for 10 - 15 € according to condition and when combined with an unframed Z maybe 50 - 75 €. With a framed Z it is genuinely scarce (as are all rouble overprints combined with framed Z) and it should probably retail at 150 € but could sensibly be offered as a single Lot in a specialist auction, something which is not true of the regular 10r or the 10r over unframed Z. At 150 € it would be cheap relative to its scarcity - but Armenian philately is repeatedly "spoilt" as a collecting area by the constant stream of new forgeries and the equally constant stream of catalogue errors, most recently in the ARTAR handbook. Both have the effect of making buyers cautious.